After dispatching their four other opponents in the Southern Football Conference West; Bristol, Cornwall, Dorset & Torbay, the only remaining team was Swindon. The Saints travelled with superior numbers once again, which gave them the depth and flexibility over their opponents. Swindon on the other hand have had a difficult season, suffering three crippling defeats in their last three games, with Oxford adding a 4th. To add further problems, starting quarterback Greg Roscow suffered a season-ending injury earlier in the year with no established back-up option available. Oxford began with the ball and American quarterback Destin Maulding continued to lead Oxford’s campaign in his first year, guiding the Saints offense to a dominant display as they claimed 9 touchdowns throughout the game. On the opening drive, running back Antonios Athanasiou picked up a 1st down before the ball was passed to tight end Richard Bloomer for a 17 yard gain. Running back Ryan Kingshott, a Saints veteran recently returning to the team, picked up another first down before quarterback Destin Maulding ran in the touchdown himself from 11 yards out. Kicker Sam Fielden added on the extra point and the Saints took a 7-0 early lead in the opening minutes of the game. The Swindon offense took to the field for the first time and failed to make any progress. 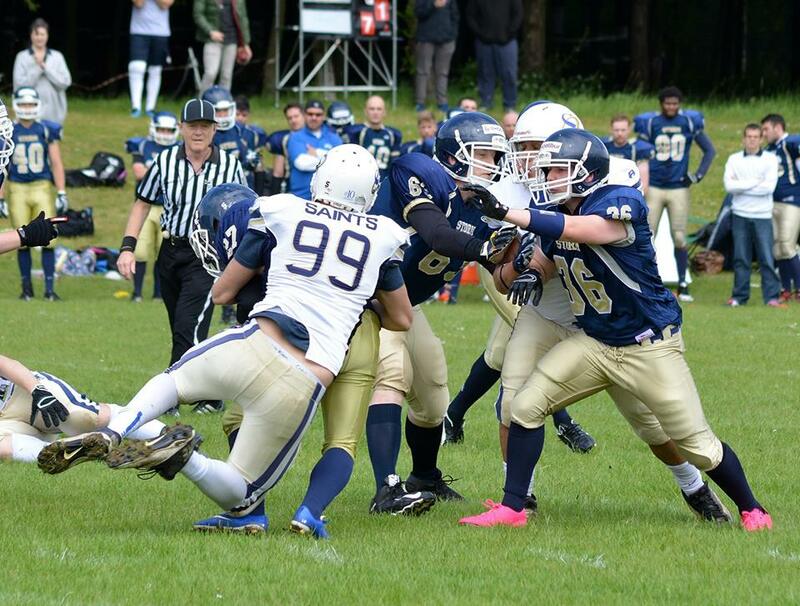 After two incomplete passes, defensive end George Wright tackled the ball carrier for a 2 yard loss, forcing Swindon to punt the ball away. 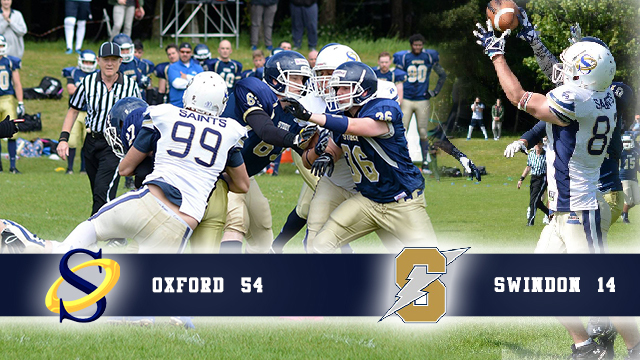 Back in control, the Oxford running backs put on a strong display and powered through the Swindon defenders for 3 consecutive first downs. Athanasiou picked up 15 yards, followed by a 19 yard gain for Luke Fry. Athanasiou carried the ball again for a further 18 yards. In close scoring distance, Kingshott ran the ball in untouched from 4 yards out for his first score of the season. Fielden’s extra point kick was blocked, 13-0 Oxford. 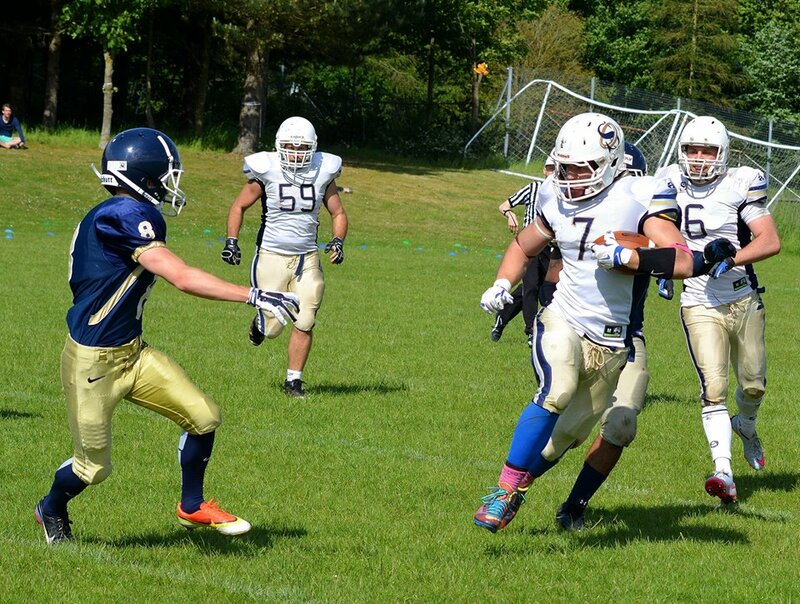 Shortly after, running back James Walter rampaged through the Swindon defense for a 31 yard touchdown run. The Saints then made a 2 point conversion when Athanasiou crossed the line for the extra points. 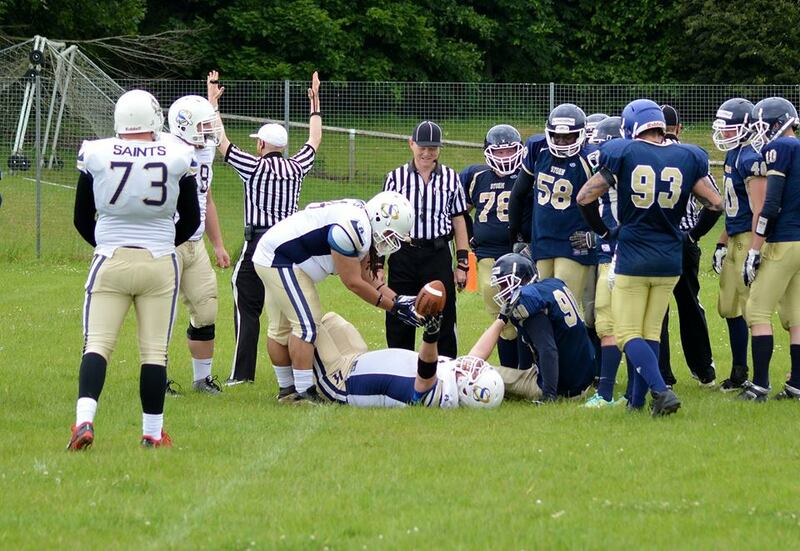 When the ball was kicked back to Swindon to return, Storm player Toby Noakes managed to find space and out-run Oxford’s kick-off unit and into the endzone. Luke McEnroe made the extra point. To close off the first quarter, more impressive running from Athanasiou was followed by another touchdown run from James Walter, this time from 28 yards out to add another score. Fielden attempted the extra point kick but it was blocked. 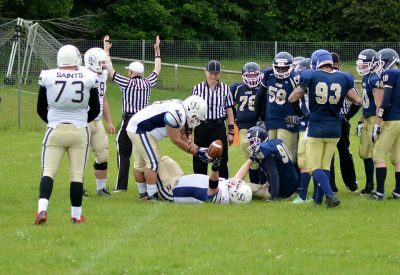 The Saints defense continued to prove a formidable opponent for Swindon and they struggled to make any gains. 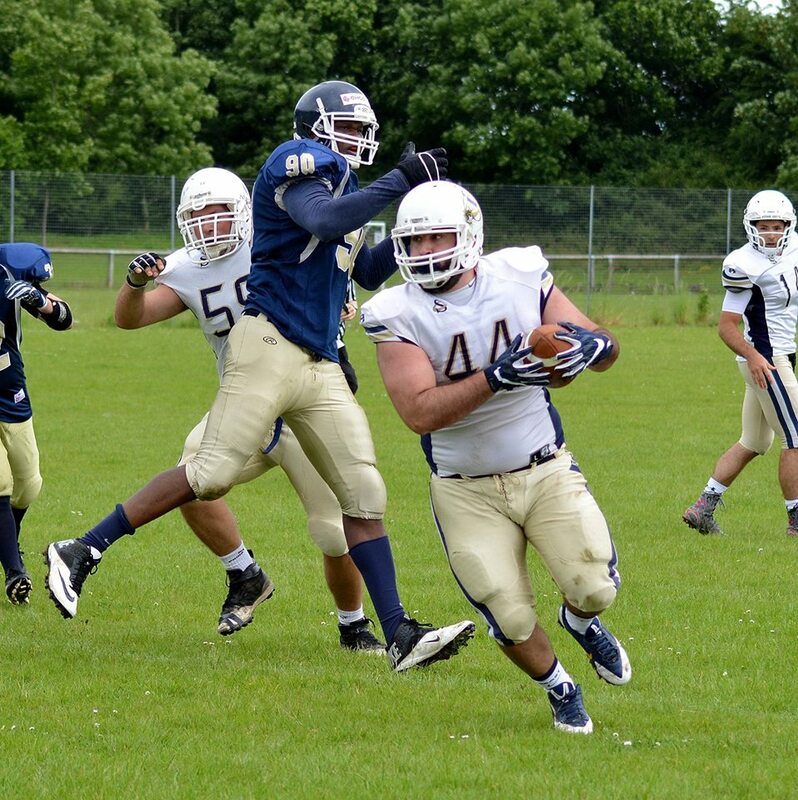 Linebackers Sam Stancombe, Mat Smith and Spencer Duffy took it in turns to bring down Swindon’s ball carriers behind their own line, each for negative gains. With Oxford’s offense back on the field, the workload was shared out between the range of running backs on the Saints squad. Walter picked up 20 yards before teammate Kingshott charged through for a further 20. Up close to the goal-line, the Saints ran a special formation and the ball was put in the hands of offensive lineman Tyson Blackstock. The ball came loose as Blackstock attempted to cross into the endzone and players from both sides dived on the ball. As the officials closely inspected the action, it was observed that Oxford’s centre Stuart Cribbes was the man at the bottom who secured the ball for the score. The Saints attempted a 2 point conversion but were unsuccessful, but extended the lead to 33-7. Another dominant display from the defense prevented Swindon from making any progress, including a tackle behind the line from George Wright for a 7 yard loss. Oxford moved even further ahead on the scoreboard when Maulding gave the ball to Walter, breaking through for a big 67 yard touchdown run aided by great blocking from receiver Ali Galbraith. Fielden kicked the extra point and the Saints pulled away, 40-7. Another failed coverage job by Oxford kick-off unit saw Swindon’s Lee Hobbis return the ball all the way into the Saints endzone for a score. McEnroe’s kick was good. Dissapointed by allowing another score to Swindon, the Oxford offense began marching down the field once again, this time with running from rookie running back Azad Allie and an 18 yard gain from veteran Grant Tebb. In scoring distance, quarterback Maulding threw a 17 yard touchdown pass into the corner of the endzone which was hauled in up high by Ali Galbraith. Fielden’s kick was good, 47-13 Oxford. Oxford’s coaches continued to rotate players and their first drive after the half resulted in a punt. The Swindon returner was looking to find space up the sideline to make a considerable gain but ran straight into the path of offensive lineman Tyson Blackstock, who knocked the returner to the ground stopped what could have been another Swindon touchdown. Swindon’s offense continued to falter and were unable to find a way of moving the ball against the experienced Oxford defense. On back to back plays their ball carriers were tackled for a loss of yards, with tackles from Chris Garland, rookie Greg Lewis and George Wright. The Saints returned to the hard running of Athanasiou and Kingshott who were unstoppable, with Athanasiou picking up 32 yards and Kingshott 19. Within scoring distance, full back Connor Day ran up the middle into the endzone for his first career touchdown. Maulding attempted the 2 point conversion and found tight end Sam Armstrong uncovered in the corner of the endzone, making a easy pass for the additional points. With further rotation and the running clock continuing to speed up proceedings, the Saints defense continued to hold firm against Swindon’s offense. Rookie quarterback Kyle Swann took to the field for Oxford to close out the final minutes of the game. Swann soon connected on a deep pass with Maulding, who lined up at receiver and caught the ball but landed just out of bounds, negating the score. The Saints firmly controlled the day picking up over 500 yards on offense. Meanwhile, the Saints defense were formidable and held the Swindon Storm to -5 yards by comparison, allowing no touchdowns or first downs to their opponents. James Walter had another excellent performance for Oxford, running the ball 9 times for 157 yards and 3 touchdowns, with a average gain of 17.4 yards per play. Another one sided affair, Swindon showed a promising start to the season but then suffered 3 back to back losses from Cornwall and Bristol, before the Saints delivered a crushing 4th. The Saints take on Swindon again on 14th August for the return fixture when they travel to Tilsley Park, Abingdon. 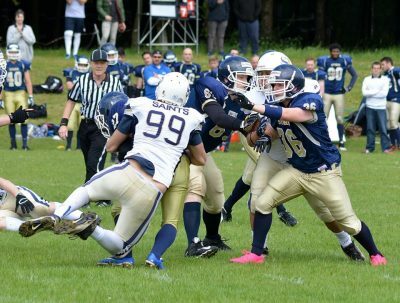 Oxford now sit at the top of the conference at 5-0 and have two weeks of training before hosting the much stronger Bristol Apache on 3rd July at Tilsley Park, in yet another highly anticipated fixture.